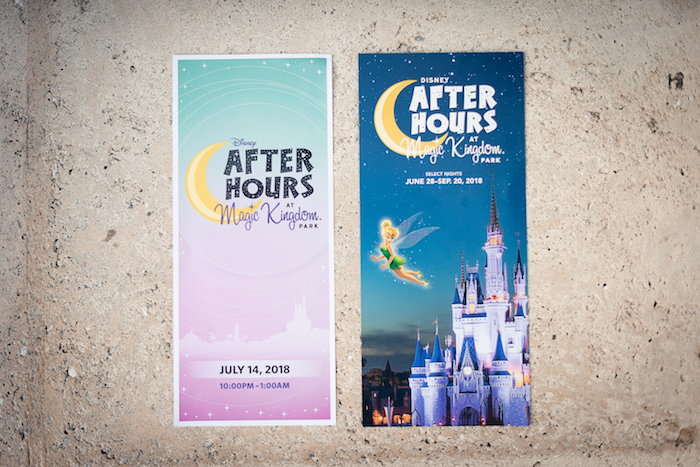 Join us for a full run-down of the Disney After Hours exclusive event experience! First, we would like to thank Disney for providing admission for this exclusive event so we could bring you this detailed review! Before we start talking about the fun stuff, let’s go through the basic event information. 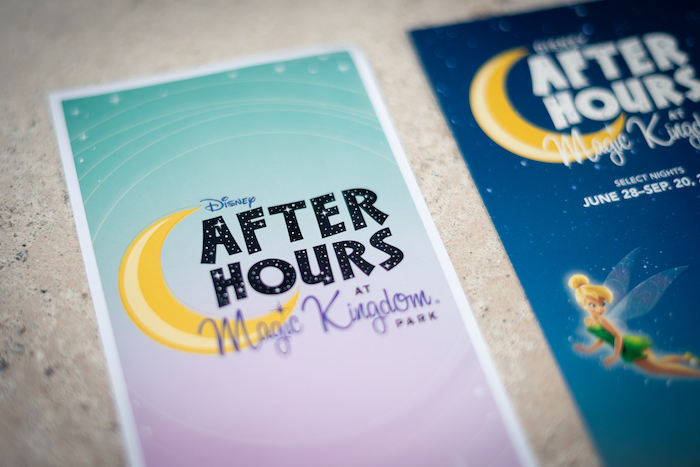 The Disney After Hours event is a separately priced ticket, and takes place on select nights. With this ticket, you are able to check-in and enjoy the park as early as 7pm. If you purchase tickets in advance, the price is $125 per person (plus tax). At the gate, tickets are $129 per person (plus tax). 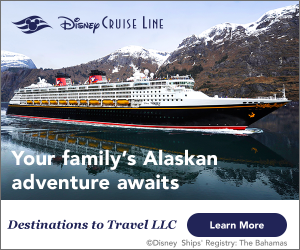 If you are an Annual Passholder or Disney Vacation Club member, tickets are $95 per person (plus tax). You can purchase tickets online, through the Disney reservation center, or at the gate. A limited number of tickets are available, so we’d suggest purchasing in advance so you can secure your spot and save a few bucks in the process. Ok, now for the fun stuff! 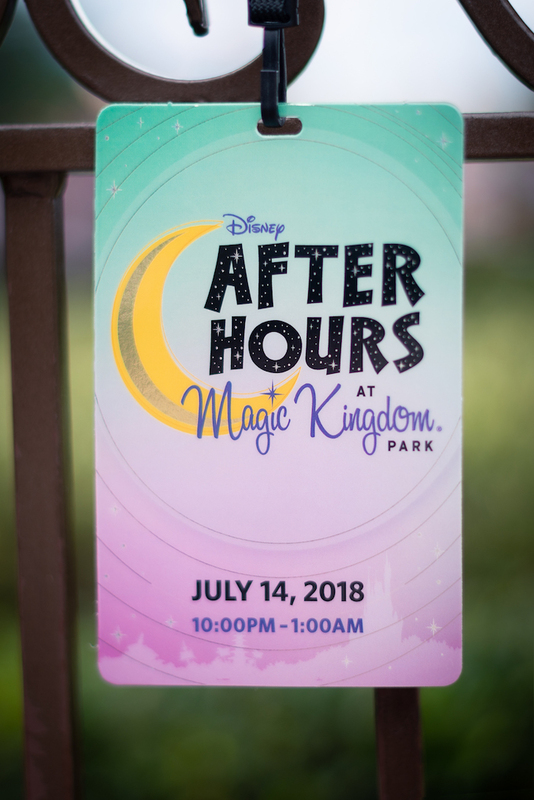 What exactly is the Disney After Hours event? Well, it’s exactly as the name implies. 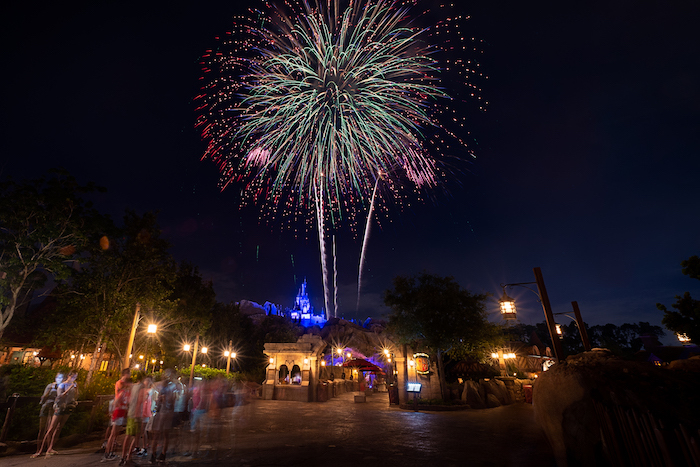 You have the chance to enjoy Magic Kingdom after the park is closed. Since only a limited number of tickets are sold for each event date, this means lower wait times and less crowds! When we arrived at the park and had our event tickets in hand, we took the Monorail over to the Magic Kingdom entrance and followed the Disney After Hours signs to the appropriate touchpoints. After getting the green light we were given these awesome lanyards to wear so cast members would know we were attending the special event. Disney After Hours Guest Pass. Photo by Courtney Reynolds. We checked in around 7pm so we could take advantage of the extra park hours before the actual event started at 10pm. I highly suggest doing this, especially if you want to grab dinner at a specific restaurant or meet a character that might not be available during the event. 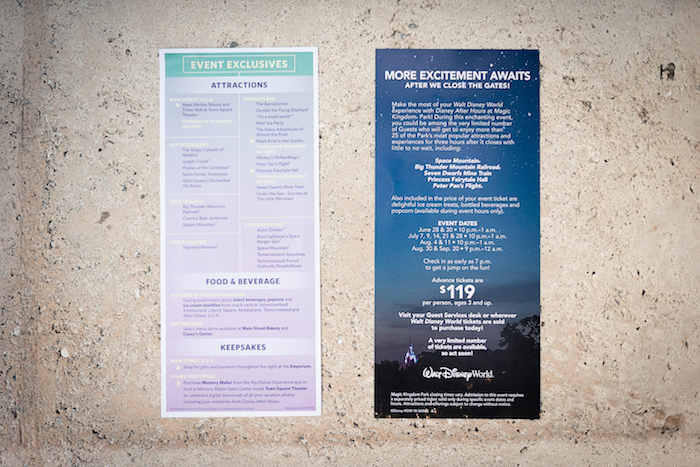 During the event, select menu items are available at Main Street Bakery and Casey’s Corner. Everything else is closed. That means if you want to grab a Super Stretchy Burger from the Tomorrowland Expo or try the new Peter Pan Float (which is what we did!) then you’ll want to get there at 7pm. The same goes for characters. During the event, only Town Square Theater, Ariel’s Grotto, and Princess Fairytale Hall are open. Pete’s Silly Sideshow is not open during the event, so if you have your heart set on meeting Donald or Daisy, for example, then you’ll want to get there at 7pm. When we arrived, we went straight to Main Street Bakery to try the new Mermaid Cupcake! Since the park was still open, Main Street was a bit crowded so we grabbed a table in Tomorrowland to do a little cupcake photo shoot. 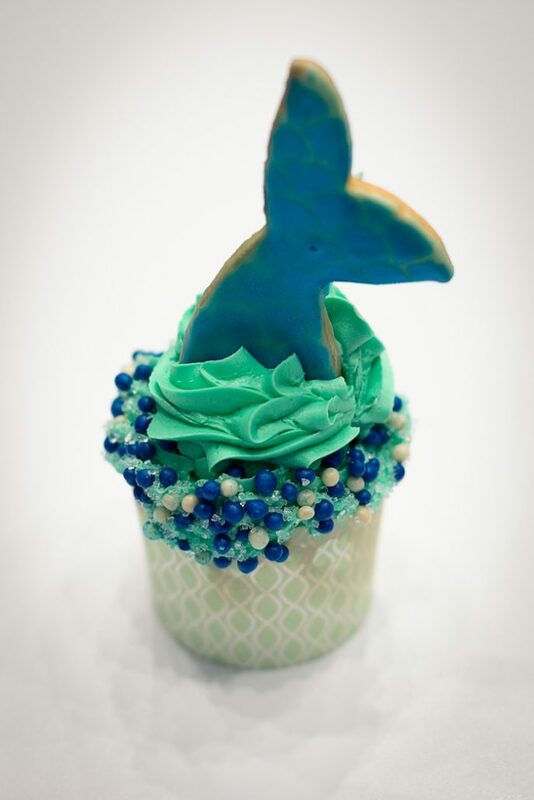 Mermaid Cupcake. Photo by Courtney Reynolds. This cupcake was almost too pretty to eat! 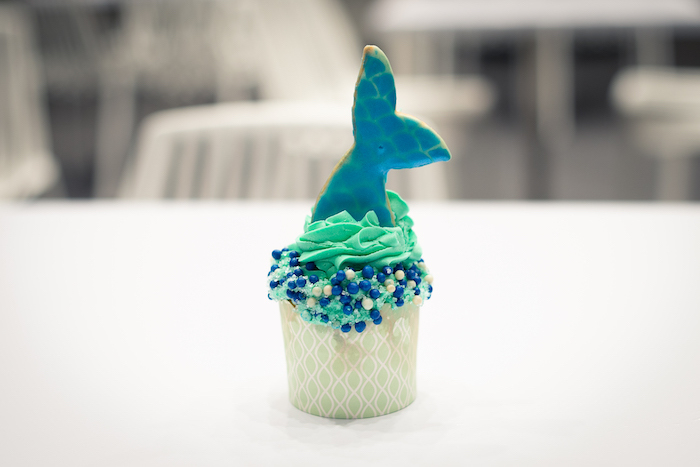 The mermaid tail is a sugar cookie with iridescent mermaid scales painted on. (Be careful though, the edible paint rubs off very easily and will turn your fingers blue. I learned this the hard way so you don’t have to!) The cupcake itself is a funfetti cupcake with an enormous heap of frosting on top. You will 100% need a fork to eat this. Words cannot describe how delicious this cupcake was! The cake was moist. The frosting was sweet. The sprinkles added the perfect crunch. This may honestly be our new favorite cupcake at Walt Disney World. It’s the perfect treat to share with a friend! Get the Mermaid Cupcake at Main Street Bakery for $5.99 (plus tax). 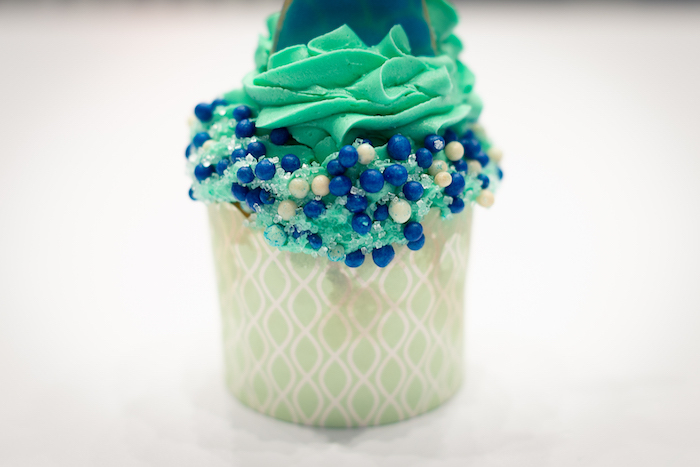 After we finished our Mermaid Cupcake, we set up to photograph Happily Ever After. Main Street was already very crowded so we decided to watch the fireworks from Fantasyland so we could have a little bit more room. If you haven’t tried this spot before, I highly recommend it! 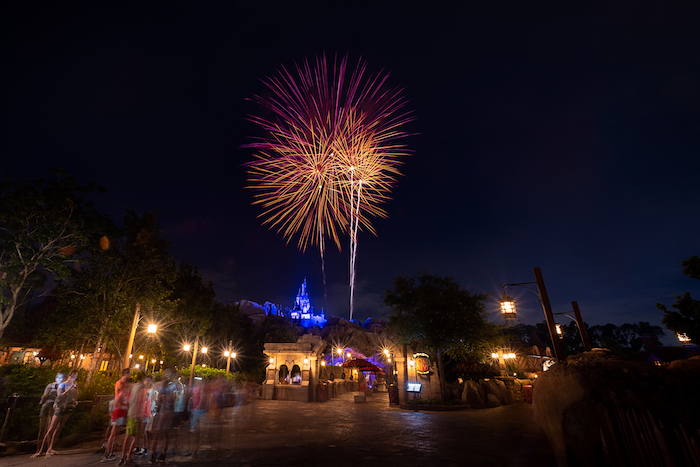 You don’t see the projections, so it wouldn’t be a good spot for a first-timer, but since most of the fireworks are set off behind the Beast’s castle you get a great view of the fireworks without many people around you. 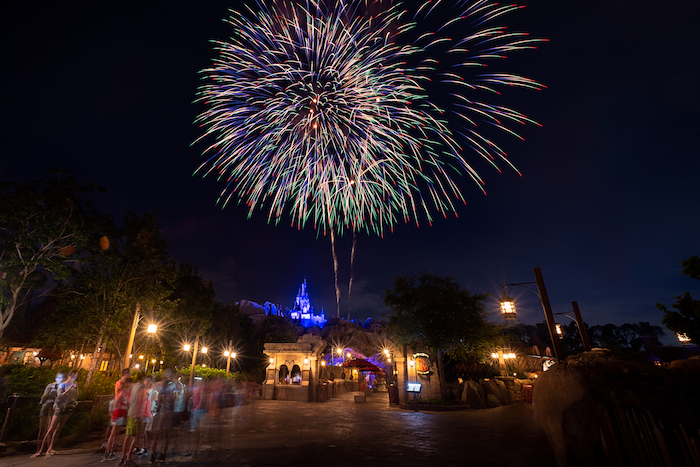 Catching fireworks from Fantasyland. Photo by Courtney Reynolds. The fireworks ended about a half hour before park closed so we had just enough time to stop by Storybook Treats to try the Peter Pan Float. 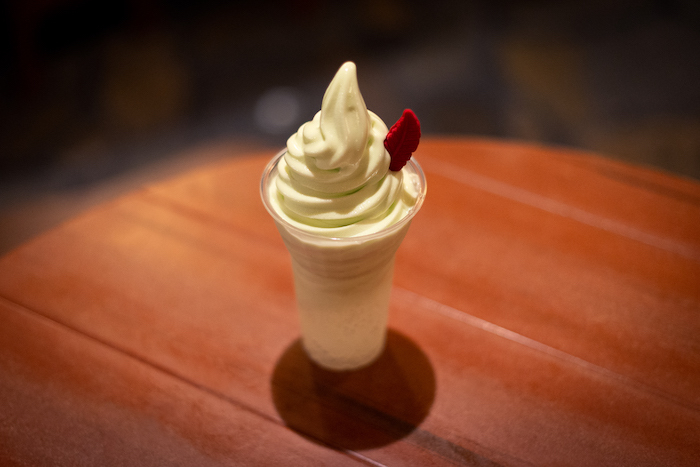 The Peter Pan Float features key lime soft-serve and Sprite, and is topped a red chocolate feather. I honestly wasn’t sure what to expect, but I definitely wasn’t expecting to love it as much as I did! If you love tart flavors, then you’ll love this float. The key lime soft-serve works great with the lemon-lime soda. It’ll serve as a great alternative option to the Dole Whip Float at Aloha Isle! Get the Peter Pan Float at Storybook Treats for $5.49 (plus tax). The NEW Peter Pan Float. Photo by Courtney Reynolds. The Whole Park to Ourselves! 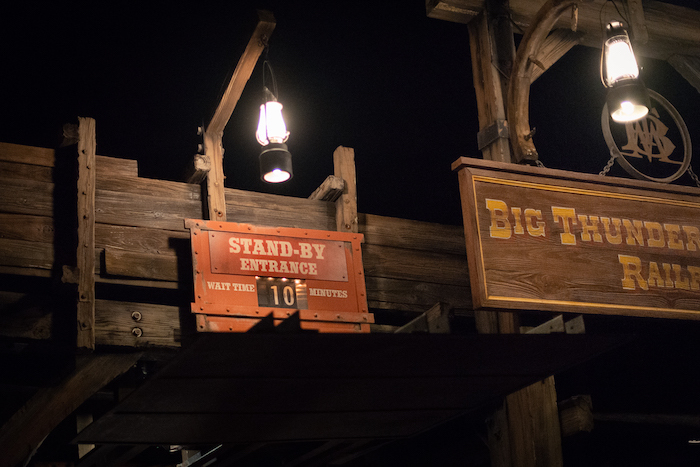 At 10pm the general admission day guests began filtering out of the park, but we had our trusty Disney After Hours event lanyards on so we could continue to enjoy the park and have access to the attractions until 1am. We started off in Liberty Square and right off the bat we noticed how few people were still back there. They were not kidding when they said this is a limited ticket event! The walkways were practically empty, with only a few other guests walking by at any given time, even the Hub. It was almost eerie how empty it was. 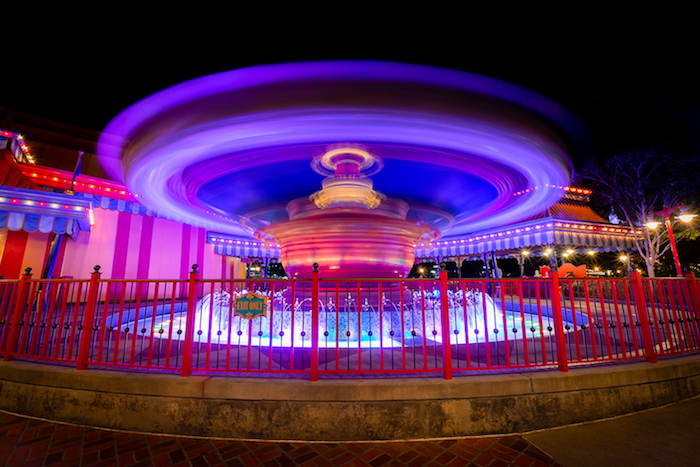 You could easily ride every single attraction during the three-hour event time, and probably still have time to ride some twice! We didn’t wait any longer than 10 minutes for any attraction, including Seven Dwarfs Mine Train! 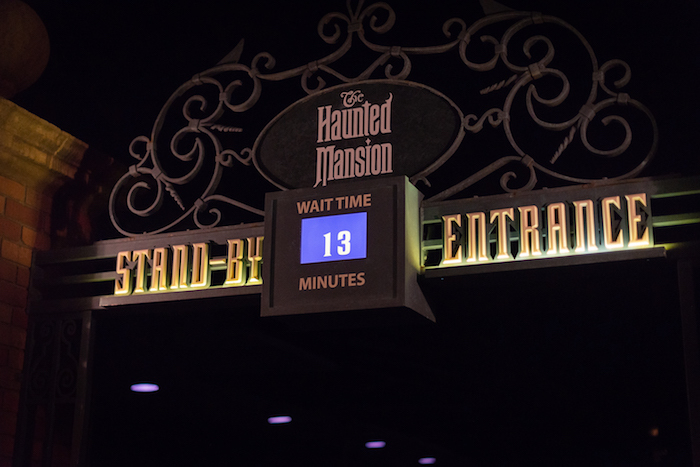 13 minutes means no wait on Haunted Mansion. Photo by Courtney Reynolds. Super short wait for Big Thunder Mountain. Photo by Courtney Reynolds. Walk on to Pirates of the Caribbean. Photo by Courtney Reynolds. 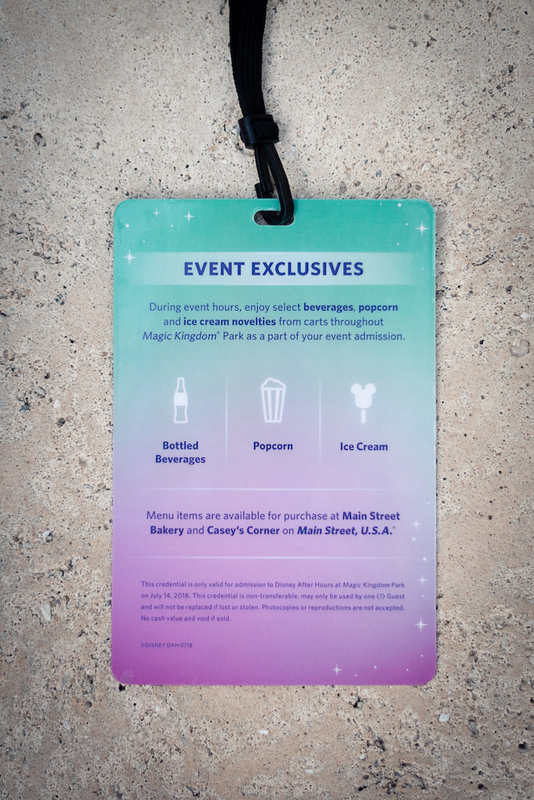 If the wait times alone aren’t enticing enough: bottled beverages, popcorn, and ice cream are INCLUDED with your admission. I’m talking UNLIMITED Mickey Ice Cream Bars, people! You can stop by any of the snack carts throughout the park as many times as you want throughout the night. If you need a coffee to stay awake or just don’t want popcorn or ice cream, Main Street Bakery and Casey’s Corner are also open during the event. You’re probably still wondering, is this event worth it? With the extremely low wait times, unbelievably low crowd level, and unlimited treats, I strongly believe it’s worth it. Although there isn’t exclusive entertainment like there is at Mickey’s Not-So-Scary Halloween Party or Mickey’s Very Merry Christmas Party, it still felt exclusive because of how few people were left in the park. 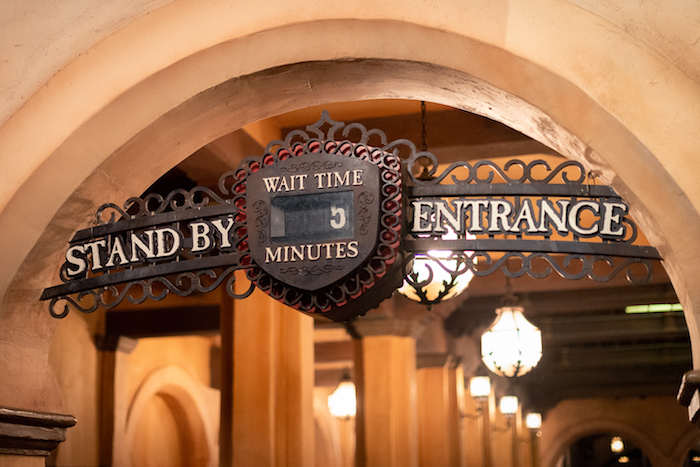 I personally think you can get more done in the three-hour event window (even more if you take advantage of the 7pm check-in) than you can in an entire normal day at Magic Kingdom. Plus, you get to enjoy the park at night, which I personally prefer since I tend to turn into a roasted tomato in the sun. This event is also great for photographers or anyone looking for beautiful Magic Kingdom shots without a crowd of other guests in the frame. I was able to get some photos on Pirates of the Caribbean and a cool photo of Dumbo without any hassle. 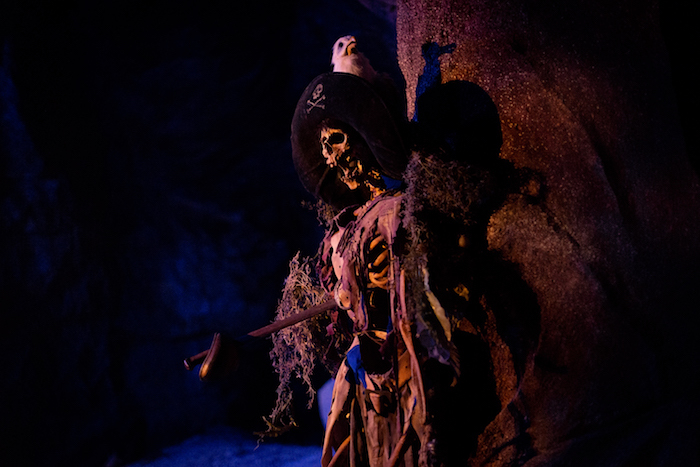 Dead men tell no tales… Photo by Courtney Reynolds. 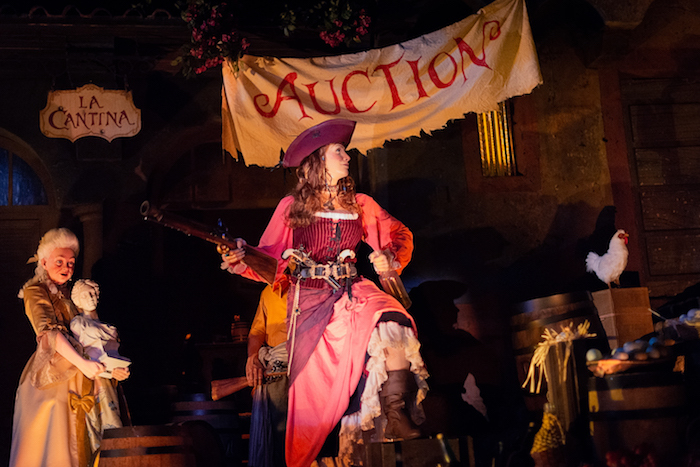 Redd’s a pirate now!. Photo by Courtney Reynolds. There’s still time to check out this awesome exclusive event, and I highly encourage you do so! We had a great time and can’t recommend Disney After Hours enough! It really is the best way to maximize your time at the Magic Kingdom. Dumbo shines at night. Photo by Courtney Reynolds.